You are here: Home › Blog › Fun › General › Earth to Sky Calculus Group: Indonesia or Bust! Earth to Sky Calculus Group: Indonesia or Bust! Next week, student members of the Earth to Sky Calculus group will depart for Belitung Island in Indonesia to observe the only visible total solar eclipse in 2016. 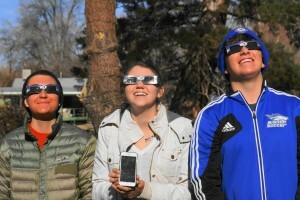 “Ferris Molina, Mia Yarborough and Joey Harvey (the phone held by Mia shows the fourth student – Ginger Perez, unfortunately her image cannot be seen). 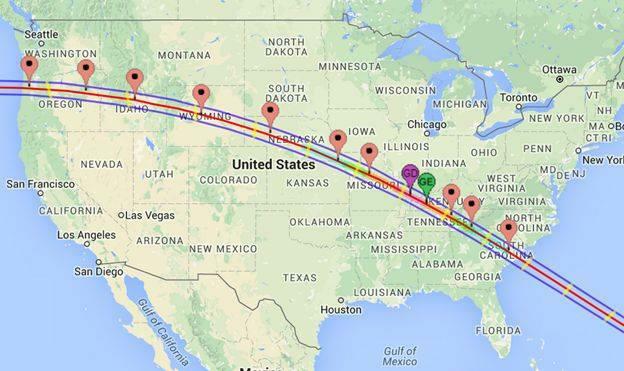 The trip will serve as a dry run as the members of Earth to Sky gear up for the 2017 Great American Eclipse. In 2017, a total solar eclipse will be visible from Oregon to the Carolinas, during which Earth to Sky intends to launch a dozen weather balloons along the path of the eclipse, photographing it from the edge of space and collecting important scientific data. In 2014, Earth to Sky made history by photographing the first pictures of a partial eclipse from the stratosphere. Photographing a total eclipse, especially from the edge of space in a flying lunch box, presents a much more daunting task. Thus necessitating a trip half-way around the world to a small island in Indonesia. Earth to Sky Calculus is a student group made up of Bishop High School students and graduates. Through the leadership of Dr. Tony Phillips, who started the program with a group of BUHS students in 2011, the students have become leaders in high-altitude astrophotography. In 2015 they launched 42 balloons, including two launches from New Hampshire. Their expertise has been recognized by NASA, which visited the group’s launch site in Aspendell to observe and learn from these students. 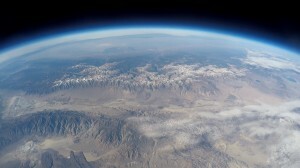 This photo entitled “wow” is a photograph taken from one of the group’s balloon launches depicting the Owens Valley as seen from the edge of space. On Friday, March 4th, Earth to Sky students Ferris Molina, Joey Harvey, Mia Yarborough and Ginger Perez, together with an adventurous parent chaperone, will begin their trek to Indonesia. Thirty-nine hours later and after a very long layover in China, the crew will make their way to Jakarta. After taking a short flight to Belitung Island, they will begin seeking out the perfect place to view the March 9th early morning eclipse. Since an actual weather balloon launch in Indonesia would land either the Indonesian jungles or the waters of the Java Sea, the group will use a ground based “balloon simulator”: the payload, i.e. lunchbox, will dangle between the legs of a tall tripod. 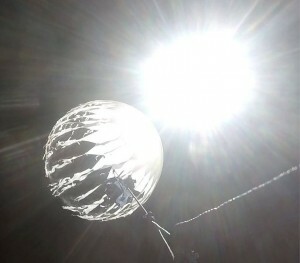 This photograph entitled “pop2” depicts the weather balloon just as it pops. The students will gently spin and buffet the camera during the eclipse to simulate the motion of stratospheric flight. The group has used this technique before to prepare for lunar eclipses and it has worked. This simulation will allow the group to experiment with different photo settings to record the sun’s corona as well as the motion of the moon’s shadow along the ground. The information gathered will be used to photograph the 2017 Great American Eclipse from a dozen weather balloons flying to the edge of space, creating a never before view of a total eclipse. Earth to Sky is not simply about astrophotography. The members collect data from each of the flights which, among other things, measures radiation levels and its potential effect on humans. In order to collect the data, the payload must be recovered. 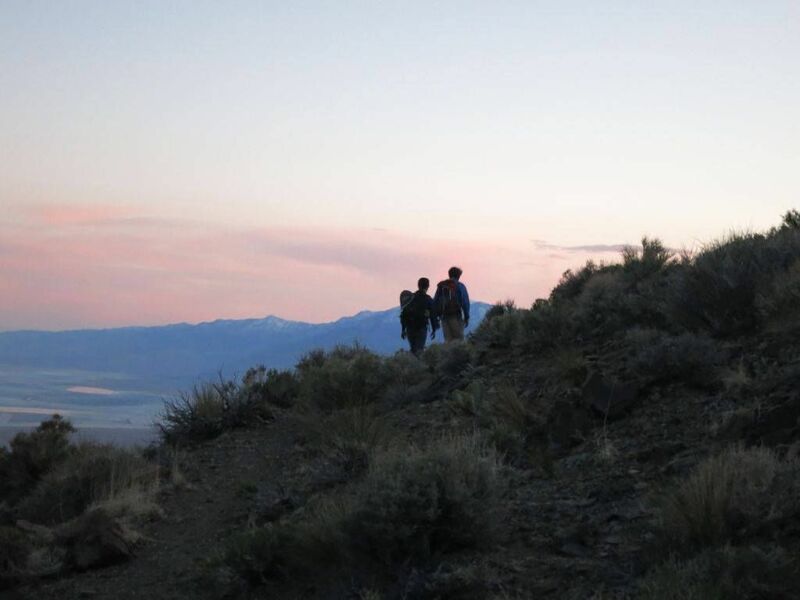 Through GPS trackers, Earth to Sky members have traversed Inyo and Mono counties to recover the payloads. Earth to Sky students recovering a payload. Recent graduates of Earth to Sky have been accepted to Princeton, Berkeley, Stanford, Babson College, Kings College (London), California Maritime Academy, University of Oregon and other top-notch schools. As a student-run organization, fund raising is essential to the continued success of the program. The students raise funds for their balloon launches through sponsors who pay to have their logos or other items photographed from the edge of space. They also sell coffee and “mutant yeast” which they have flow in their payload. Anyone interested in supporting their efforts is invited to visit the group’s GoFundMe site at https://www.gofundme.com/earthtosky or contact Dr. Tony Phillips at dr.tony.phillips@gmail.com.